Upon arrival you will be met and assisted by our representative and transferred to hotel which is located close to the district of Thamel and offers modest but comfortable accommodation in a property that blends traditional architecture with modern convenience. A pre-trek briefing will be conducted today. This will offer you the ideal opportunity to ask any last minute question that you may have. A half day sightseeing tour will also be arranged. Overnight at the hotel. Day 03: Kathmandu - Lukla (2880m) - Phakding (2743m). Our early morning flight by Twin Otter aircraft rushes us to Lukla, the most renowned mountain airstrip in the world. On the flight we watch the rugged foothills gave way to the snowline of the Himalaya; many of the world’s highest mountains, including Kanchenjunga, Lhotse and Makalu (the world’s 3rd, 4th and 5th highest respectively) may sometimes be seen from the window of the plain. On arrival, we meet our Sherpas and after a cup of tea we pick up the trail out of Lukla. Surprisingly, the high - attitude trek begins by descending to the river at Phakding. Overnight at Phakding. Day 04: Phakding – Namche (3445m). The first day may have been surprisingly long for some, but overnight at Chauma allows us to begin the ascent to Namche Bazaar first thing in the morning. At about half-way up the hill, a gap in the trees will allow us to spy Everest for the first time. If the weather is clear the top of the South-West Face will be just visible behind the long Lhotse-Nuptse ridge. A plume can often be seen stretching away from the very summit. 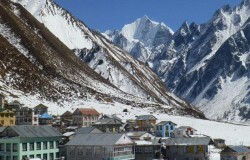 Namche is the most prosperous and the largest town in Kathmandu. A bazaar is held here every Saturday. The wares on display include meat, grains and vegetables, tennis shoes and trinkets as well as hand woven aprons and Tibetan boots. 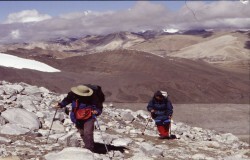 The Sherpas play host to trader from the foothills, as well as Tibetans from over the border. Thamserku (6648m), Kwange Ri (6187m) and Khumbila (5707m) surround the natural bowl that the Namche sits in. Day 05 Namche – Rest/acclimatization day. We take the day off to allow our bodies to adjust to the rarefied atmosphere before ascending to higher altitudes. The secret of safe acclimatization is to ‘climb high, sleep low’ so it is safe for the more energetic amongst us to hike up the hill behind Namshe to the airstrip at Syangboche, or stroll across to the museum behind the police post. Namche is a busy and bustling trading place and there in always plenty going on. We return back down the valley via Thamo, a hillside nunnery, and then take a high trail that passes Namche and finally drops into Khumjung. This village is one of the most beautiful in Khumbu. The Himalayan trust has a school here, as well as a medical post (for locals and trekkers) in the nearby Khunde. The trail this morning descends to the Dudh Khosi. There are spectacular views of Ama Dablam (6696m) and Kantega (6779m) as well as Everest (8848m) and Lhotse (8501m). Keep a look-out for pheasant in the undergrowth. We cross the river at Phunki Thanga and climb through the afternoon amongst rhododendron forest to the saddle at the top of the hill. Suddenly in front of us is Tengboche, the principal monastery of the Khumbu area; the views from here are unforgettable. Day 09: Tengboche – Rest/acclimatization day. Another catch-up day for our bodies. Nearby ridges offer the opportunity for a half-day hike to get close-up views of Ama Dablam, whilst the monks usually give conducted tours around the monastery. Day 10: Tengboche – Dingboche (4412m). We follow the path down from Tingboche through the rhododendron forest to Dingboche and cross an exciting bridge with the boiling roaring Imja Khol beneath our feet. A gradual climb takes us to the village of Lower Pangboche. We are now in the heart of the Khumbu, with spectacular views across to Ama Dablam. The afternoon stroll takes us along a path that hugs the valley wall and then across wide plains to a split in the valley. The Khumbu breaks lift, up to Periche, but we take a detour right to the hamlet at Dingboche at the start of the Imja Tse valley. Day 11: Dingboche - Rest/acclimatization day. Rather than just sitting around in the or tea house, we encourage you to attempt one of two hides, the shouter option ascends the hill immediately behind Dingboche, to drop steeply down to Periche, The Himalayan Rescue Association operates a medical post here and the western doctors conduct excellent seminars on Altitude Mountain Sickness (AMS) here on most afternoons. The longer option is to trek up the Imja Tse valley towards Island Peak. The views of Lhotse, Ama Dablam and Cho Polu from here are outstanding. After a few hours the trekker terminus of Chukung is reached, and after a rest we return down the valley. 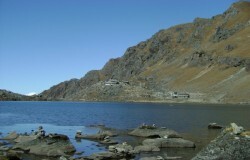 Day 12: Dingboche – Loboje (4931m). We climb up to the ridge behind Periche and stay high, mesmerized by the views of Tawoche and Cholatse, until we reach the tea houses at Dughla. A stoop, stiff ascent to the terminal moraine of the Khumbu glacier is now tackled. The top of the climb is marked by a series of stone monuments to commemorate some of the climbers that have not returned from expeditions to this region. A rough but obvious trail cuts across left, away from the glacier, to our camp site at Loboje, a windswept collection of huts tucked in a narrow meadow between the glacier and the Loboje Peak (6156m). The Lhotse ridge is simply awesome from this angle. Day 13: Loboje – Kala Pattar (5545m). – Loboje. A long day and an early start. We trek along the rough path along the side of the Khumbu Glacier to the tea shacks at Gorak Ship, behind rises the attractive 7000m peak of Pumori which dwarfs our trek’s summit of Kala Pattar. The route op is straight forward and takes most people between 90 minutes and 2 hours. All the peaks – Everest, Lhotse, Nuptse, Changtse, Ama Dablam and scores of other lesser peaks can be seen from this wonderful vantage point.A trip to the actual Base Camp (BC) of Everest is usually omitted as the Khumbu Icefall Blocks all view of the mountain and even when expeditions are on the mountain, a route to BS is difficult to find. Day 14: Loboje – Phortse (3847m). We descend all morning via Periche to Pangboche, whereupon we stay high on the west bank of the river all the way to the Sherpa village of Phortse, which lies on the lower southern flank of Tawoche, directly across the valley from Tengboche. Day 15: Phortse – Namche (3445m). We now descend through a forest to the Dudh Kosi. From the very pretty crossing point, we climb to a chorten where there are wonderful views back across the valley to Phortse, Tengboche and the surrounding mountains. Eventually we turn south off the main trail to Khunde and Khumjung, contouring past the Everest View Hotel. The route then leads down the hill to Namche roll! Day 16: Namche – Lukla (2880m). Most people head towards Lukla with a heavy heart. There is something very special about he setting, the villages and the people of the high Khumbu hills and valleys and our memories help us up the deceptively long, final climb into Lukla. Our resting spot will bi at lodge. Another chance to enjoy this great flight. Please note that flights into Lukla are sometimes delayed due to un-flyable conditions either in fog-bound Katmandu or windy Lukla; be reassured that our staff in Lukla and in Kathmandu will be doing everything possible to minimize the inconvenience caused of this happens. In such situations your patience will be greatly appreciated.Upon arrival back to Kathmandu you will be met by our representative and transferred to the hotel.Overnight at Hotel. Today is spent at leisure in Kathmandu. In the evening the management and staff will host a farewell dinner for the group in one of Kathmandu’s most famous Nepali restaurants. After that, we will drop you to the airport for your final departure. your accommodation, food( breakfast, lunch and dinner) etc. × any loss arising due to unforeseen circumstances such as accidents, road blocks, landslides, strikes etc. Season : mid September to May.